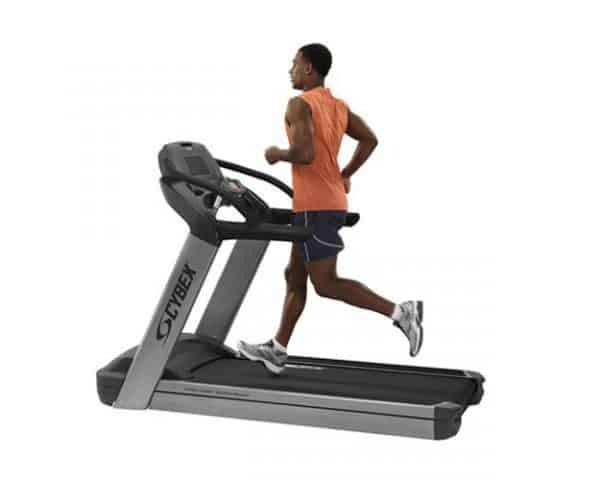 The Cybex 770T Treadmill is not your run-of-the-mill treadmill. This is a breakthrough design to encourage serious and casual fitness athletes alike to rediscover the simple joys of running, jogging, and walking. The Cybex 770T offers better stability, greater comfort, and more cardio entertainment options than any treadmill in our history. Enjoy the ride. The 770T Treadmill is the first treadmill to incorporate our patented ARMZ stabilizers to provide an added level of safety and a feeling of confidence. At the heart of the 770T is the IS3 Intelligent Suspension System, the result of extensive research conducted by the Cybex Research Institute. The 770T’s deck is soft at landing, firm in the middle and rigid at toe-off to precisely match the body mechanics of running. As a result, runners will experience a smooth, comfortable ride with minimal stress, impact and shock. 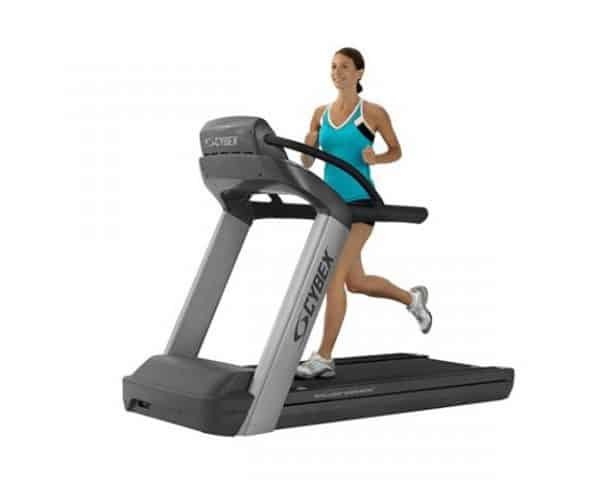 A low step up height makes it easily accessible to all treadmill users. CybexGO™ On-Demand HDTV is an optional digital media and fitness platform designed to provide users with an improved exercise experience, offering virtual workout environments, live HDTV, on-demand content and asset management features. With high definition display, the optional E3 View HD monitor offers three distinct viewing modes: Exercise, Entertainment or Escape. Each offer the precise content wanted on a 15.6” embedded high definition widescreen display. The CardioTouch™ touch screen display offers a single command center for every exercise program, allowing your members to easily set up a great cardio workout. An adjustable, dual-speed fan keeps users cool during the most heated workouts, and longer workouts mean better results. Better results = happier members. The 770T’s CardioTouch allows users to set a Time, Distance, or Calorie goal for their workout. Your members will enjoy reaching their goals and Personal Trainers will appreciate being able to constantly set new goals for clients. Heart rate can be monitored from either the contact grips or hands free from a wireless heart rate transmitter. See it at a glance with a multi-colored LED that displays a different color for specific target heart rate zones. Why stick with silver grey when there are five standard colors (white, black, platinum sparkle, metaltone gold, black chrome) to choose from? Or ... select from over 180 custom colors to match any decor. Only Cybex offers color customization in CV and strength equipment. Knows whether you are there or not and will stop the belt after the pre-selected waiting period helping to keep users safe. P.S. Don't forget to use the Safety Lanyard. Display: 4.3” Touchscreen for workout and entertainment setup and control; Graphic display of workout profile via 8 × 15 LED matrix; Numeric display of time, distance, calories, calories/hour, METs, Watts, pace and heart rate including multi-color indication of heart rate range; Lower display shows incline and speed. Colors: Choice of seven standard frame colors (Black Chrome, Nightstorm Black, Cumulus White, Platinum Sparkle, Arctic White, Eclipse Black, Metaltone Gold), premium and exclusive colors, as well as over 180 custom colors.